Home » Desiree's Blog Posts » Shooting the trailer for Chrysalis! I am currently in Kingsland, FL shooting the sizzler for the feature film Chrysalis. Yesterday my call time was 5:30 AM. I had driven 6 hours from Atlanta the night before, arriving around 10 at night and promptly going to bed. 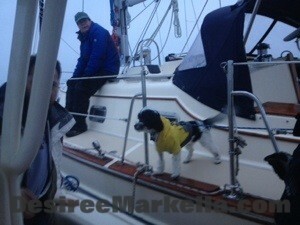 It was quite chilly yesterday morning as we took a sail boat out into the Atlantic Ocean. My first scene required me to walk out onto the very front of the boat and scream out for my husband and brother-in-law who are missing all of a sudden, leaving me stranded at sea. We had just wrapped the scene and here comes the Coast Guard! 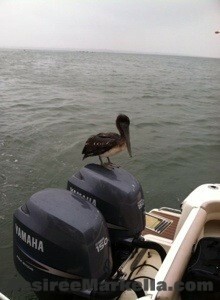 We got questioned and the boat checked haha! We passed inspection but were still escorted back to shore. After shooting some interior shots in a sail boat that was dry docked, we wrapped around 3:30 PM. I enjoyed a glass of wine and a very hot shower before going to bed. The call time this morning was 7:30 AM. We have some rain and possible snow changing some of our shooting schedule around. 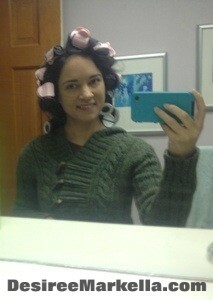 I’m just waiting to hear when they need me on set as my hair sets in these curlers!